Big and bold flavors and combination of beans, bacon, spices and potatoes. 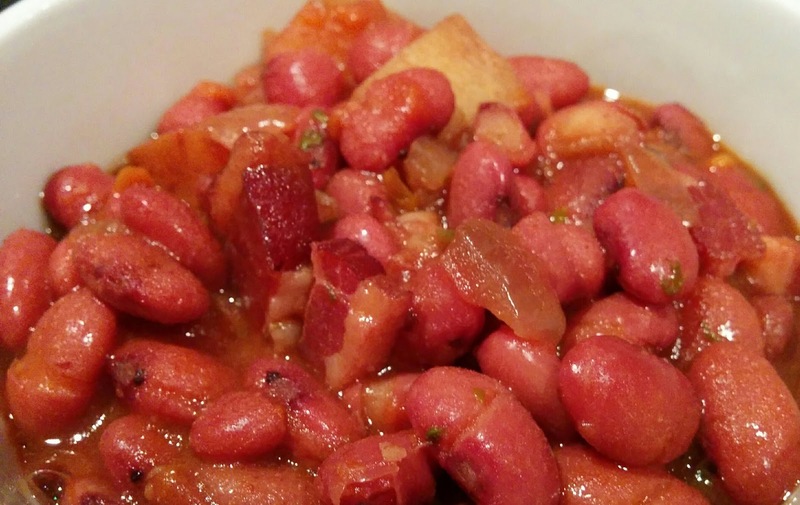 A different way to enjoy beans without the regular sweetness. These would be great as a side dish for smoked pulled pork, grilled meats, or even as a main dish! 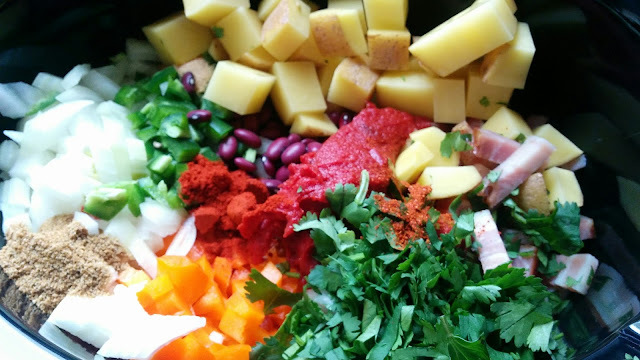 Chop all the veggies and all ingredients to a crockpot. Give it a stir to combine well. Cook at 8-10 hours on Low for dried beans until they are tender. Or, about 3-4 hours with canned beans (until potato is tender). Add salt and pepper to taste. Friends cooking together on a sunny Sunday followed by dinner on the deck. Good friends came over with their fantastic Italian exchange student, Giulia. 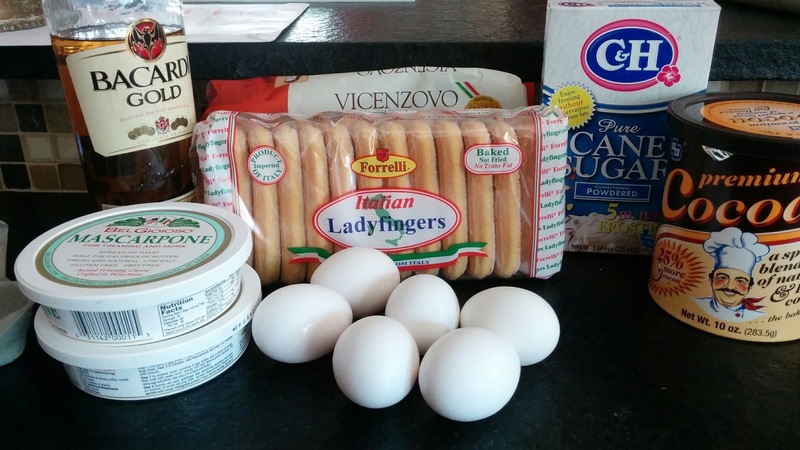 She wanted to learn to cook some American food, and I wanted to learn some of her specialities. 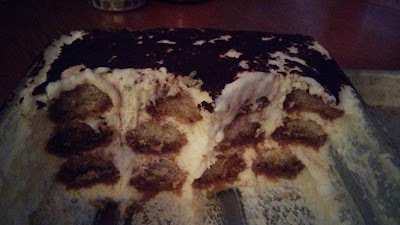 We did tiramisu, chocolate salame (recipe to come) and pasta carbonara. What did I teach her? LOL, Greek food, of course! 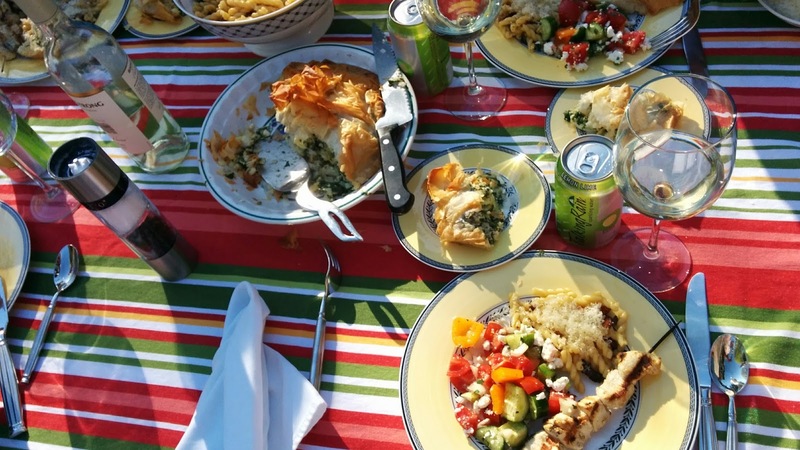 Chicken souvlaki, Spinach Artichoke Filo Pie and Greek salad. We even started a batch of Limoncello as I had so many lemons that I wanted to use up. 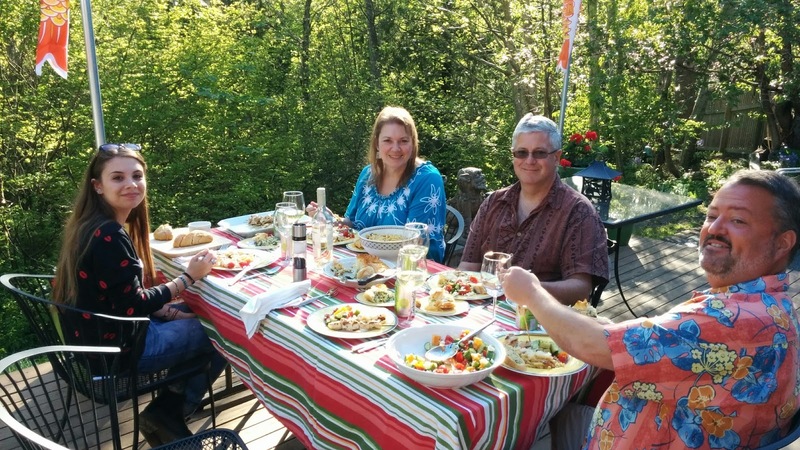 It was a beautiful day for April, and we had our first meal of the year on the deck! Note: Traditional tiramisu has raw eggs in it. I think it's amazing and delicious, but of course, so many American recipes warn you of salmonella poisoning as dangerous for kids and old people. But, I figure millions and millions of Italians can't be wrong. The whole gang assembled on the deck. Someone's shirt clashes with the tablecloth, but he looks pretty happy about it. We're in pretty intense mode in this picture, I always look a little crabby when I'm listening carefully. Here is another photo of the tiramisu a couple days later. I guess I shouldn't have taken this picture in the dark, hahaha. 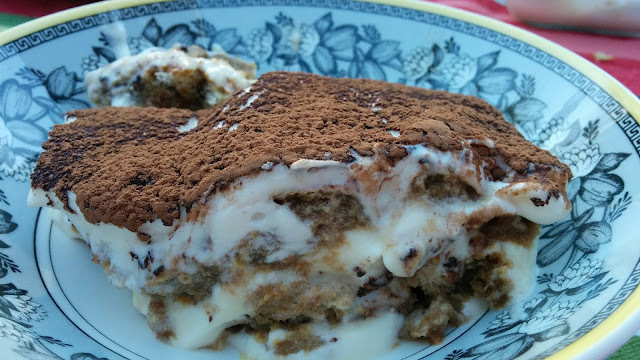 However, it does show that the tiramisu has set up considerably after being in the fridge for 3 days. At the very least, I'd suggest you make this the day before you need it. Separate the yolks and the whites. Use two medium size bowls. With an electric mixer, beat egg yolks with 1/3 cup sugar until pale fluffy yellow cream mixture. That will take about 3-4 minutes. Mix in mascarpone. Set aside. Whip the egg whites with an electric mixer, or stand mixer. Add 1/3 cup sugar and beat until they hold there shape. 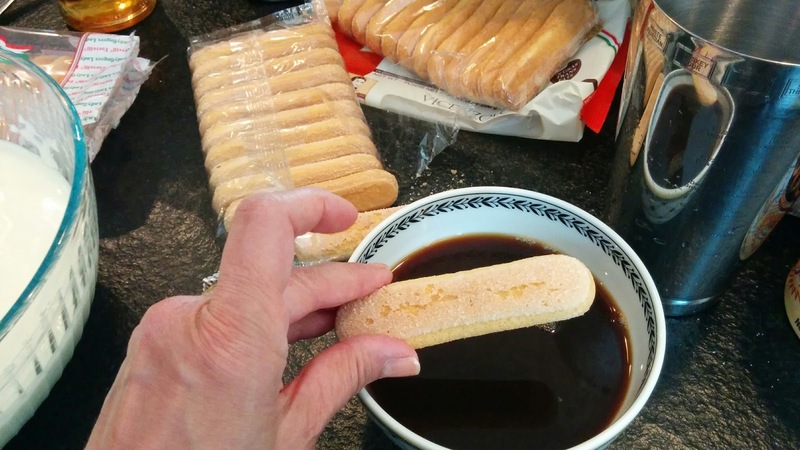 They should be firm enough to stay in the bowl when you turn it upside down (per Giulia). Set aside. 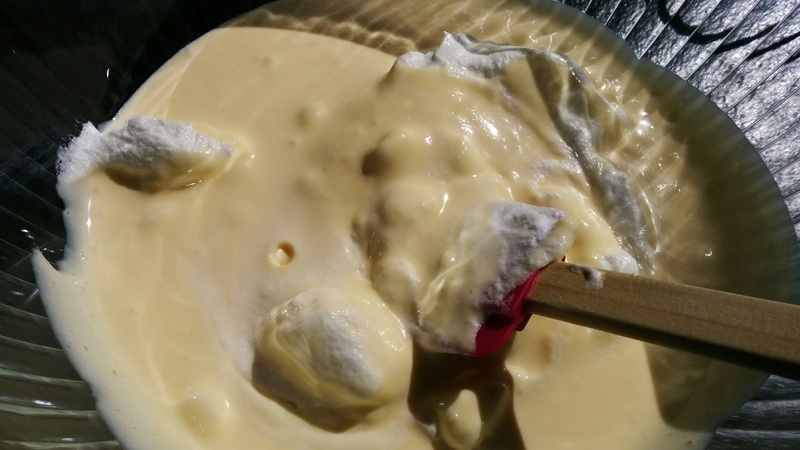 Carefully fold in the egg whites to the egg yolk mixture. Do it in two to three additions doing it slowly to retain the fluffiness. 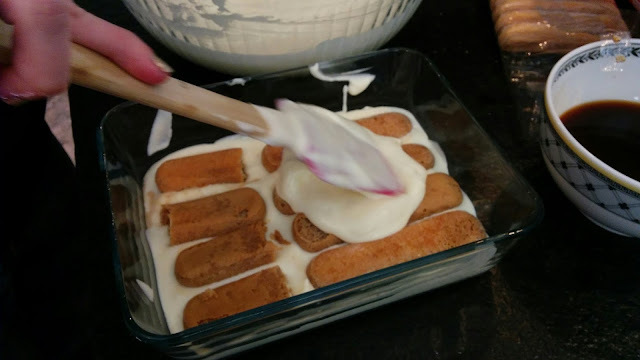 In the bottom of a large baking dish (8x8), put a layer of cream mixture, then soak the ladyfinger biscuits quickly in the coffee/liquor mixture. Don't soak them... be quick about it, IN, OUT, you're done. Layer biscuits on top of the cream, add another generous layer of cream, add more biscuits dipped in coffee. 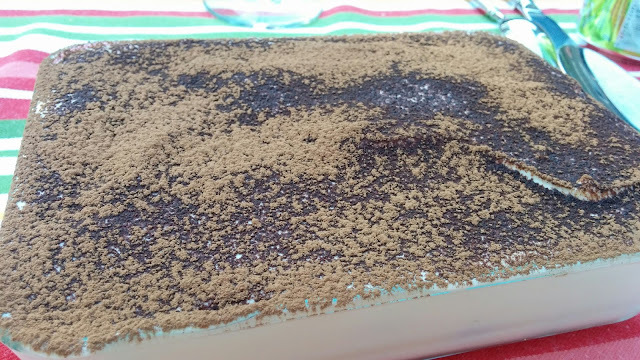 Top with third and final layer of cream. Your cream to cookies ratio will seem off, but remember, the cookies will be soaking up a lot of the cream. We made two pans, this was the small one, and we did a medium one too. I think a 9x9 pan would be perfect for one recipe. Dust liberally with cocoa powder and chill for 3-4 hours before serving.